He knew how important it was to her. It took a while for Dakotah Whitcomb to come as being bisexual to her dad. She knew that the family had many close friends in the LGBT community, and that being bisexual wasn't something he had a problem with at all. But still, it's different when it's your dad. When a waitress flirted with her at a restaurant and her brother teased Dakotah saying she probably didn't mind the flirting, Dakotah knew it was time. She told her dad that she was bisexual, and he responded in the best possible way. "That's so cool!" He said to her. But the adorableness doesn't stop there. This Christmas, Dakotah asked for an LGBT pride flag as a last minute gift. 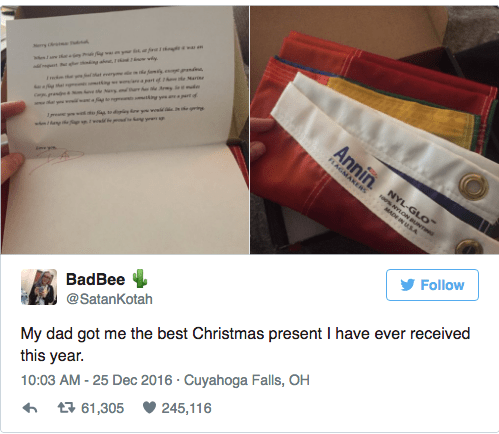 She didn't really expect her dad to follow through on the gift, so when she opened her flag on Christmas morning and read the letter he had included with it she was in no way prepared for the touching message. Um, no, I'm not crying, it's just the effects of all the onions I've been chopping today. Acceptance and love are crucial to any human being. Many members of the LGBT community are rejected by their families members and made to feel unwanted and unloved. Dakotah's dad didn't just accept her and her bisexuality, he celebrated her! Dakotah's whole family have dedicated their lives to serving different branches of the military. Because Dakotah is disabled, she has not been able to serve. By telling her that he would be happy to fly her flag alongside the other flags that represent the other members of their family, he wasn't just telling her that being bisexual was "fine", he was telling her that both being bisexual and being HER was absolutely wonderful. He'd have her no other way.